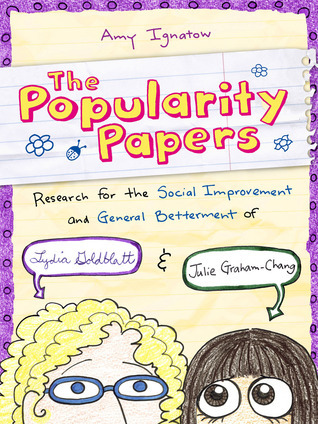 The Popularity Papers: Research for the Social Improvement and General Betterment of Lydia Goldbatt and Julie Graham-Chang by Amy Ignatow. Grades 4-7. Amulet Books, 2010. 208 pages. Review copy provided by my local library. Sixth grade is coming. And best friends Lydia and Julie are getting ready! They've both seen Lydia's older sister go through middle school, ending up a social pariah, and they're determined that their fate will be different. They will be popular! So they devise a plan to observe the most popular girls at their school and write down what they do so they can try it. Some tactics backfire, like Lydia trying to bleach a blonde streak in her hair using the bleach she finds underneath the counter. (Note to self: that bleach will burn off a chunk of your hair.) But the girls will persevere... until it starts getting in the way of their friendship. Why is being popular so important anyway? We're talking about funny books this month in our Reading Wildly book discussion and this has been a popular series since I bought them for the Children's Room last year, so I knew I wanted to pick up the first book. It's no mystery why these are popular. The cartoony, handwriting-y format is reminiscent of Diary of a Wimpy Kid and the myriad of funny cartoon diary books that have sprung up in its wake. Full color illustrations makes this series stand out. But, more than that, Amy Ignatow hits the nail right on the head with her dual tween narrators. As I was reading, I could totally imagine myself starting a notebook like this with one of my best friends in 5th-7th grade. It's easy to mess up dual narrators, even when handwriting styles can help the reader differentiate, but Ignatow gets it right. She's created two distinct characters here, passing the notebook back and forth as they record their adventures in popularity. She also gets bonus points for diversity (Lydia and her sister are raised by just their mom and Julie has two dads, a fact that's obvious throughout the book but also no big deal). The book is laugh-out-loud funny and I found myself wanting to continue reading the series purely for my own enjoyment (not because I had to for our book discussion). Readalikes: Obviously the cartoon diary format and the humorous tone is going to make this a readalike for all those Wimpy Kid-esque books (Big Nate, Dork Diaries, etc.). I'd also suggest Middle School is Worse Than Meatloaf by Jennifer L. Holm for the format. I think the full-color told-through-stuff format might appeal to kids who like all the full color cartoons in The Popularity Papers. I might also try Smile by Raina Telgemeier. This graphic novel is full color, so format is one appeal factor. Smile also deals with a girl trying to navigate the tricky waters of middle school and the story is sometimes funny and sometimes poignant. 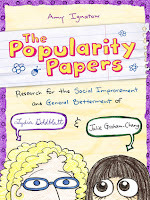 The Popularity Papers is on shelves now! And don't miss the further adventures of Lydia and Julie in subsequent books (book 5 just came out this spring! ).